WHILE most of use were staying at home shivering a couple of week-ends ago – three Tamworth musicians were locked in the cold confines of St. John’s Youth Club with only a mobile recording studio for comfort. Andy Malkin, Stuart Pickett and John Archer spent two days at the club laying down two tracks for a demo tape. The end result is the first burst of activity from the three former members of the now defunct Aardwolf. Badger is the name the band have decided on for all future projects and at the moment they are hunting for a vocalist to complete their line-up before gigging in the summer. NEW look Tamworth heavy band Badger are still on the look-out for a vocalist. Interested? Ring Stuart Pickett. TAMWORTH’S Unemployment Committee are organising another ‘Rock for Jobs’ concert in the town later this month. The event which will be the first gig at Tamworth Assembly Rooms for nearly two years, takes place on Thursday, June 17. HM Band, Badger and new wave outfit Classified Ads are the local bands who will be appearing with a disco thrown in for good measure. For more details nearer the time, watch this space. BADGER, the HM band formed out of the ashes of Aardwolf, are the main attraction at next week’s ‘Rock for Jobs’ gig at Tamworth Assembly Rooms. The gig will give the new-look heavies a chance to shine before what should be a large crowd. Badger were formed by ex-Aardwolf members Andy Malkin, guitar, Stuart Pickett, drums and John Archer, bass. But the really interesting part of their line-up is young vocalist Mick Swan – brother of Tytan front man Norman. Since leaving Tamworth to join Tytan, Norman and the band have attracted considerable attention from all sides of the national music press and this makes his brother’s prowess all the more interesting. Talented new wave outfit Classified Ads are also appearing and there will be a disco as well. Admission will be £1 and 50p for the unemployed. PEOPLE who complain about a lack of variety at local gigs might like to put their heads around the door at St. John’s Guildhall tonight. For at the venue, three decidedly different artistes will be peddling their wares. Dave Hewitt, solo songster and witty alternative entertainer, will bring his own brand of music and humour to the hall. And if Dave’s sense of humour and odd taste in trousers is not to your satisfaction, new HM outfit Badger are also on the bill. Badger will be using this gig as a warm-up for their important Assembly Rooms date previewed elsewhere on this page. Finally DHSS are due to play their first town gig for some time on the same bill. The is only the second gig the band have played with their new quieter, more restrained sound and the results could well prove interesting. TWO VERY different gigs at Tamworth Arts Centre provided two nights of really first class entertainment for the punters. It is hard to imagine a greater contrast between the comedy and song of Dave Hewitt combined with the poetry of Edward ian Armchair and the heavy rock of Badger and Omen but both nights were rich in enjoyment though for totally different reasons. Knowing it was their final gig, Omen pulled out all the stops to play their finest ever set. All the tension that has always existed between the members of the band had gone and they attacked their songs with real energy and passion. ‘Revelation’, ‘Searching’, ‘The Clouds’, ‘Castles’, ‘Get Out’, ‘Equilibrium’, ‘Through Different Eyes’ and best of all ‘Please Let Me Die’ – all their great compositions – were played with really refreshing enthusiasm. None of their movements were in the least bit choreographed, they just wanted to bow out with a gig to remember and at last silenced criticism of their lack of stage presence. From the enthusiastic response from the audience I suspect I’m not alone in mourning the passing of Omen – they were a really innovative and skilled outfit and the local scene will be all the poorer for their break-up. Badger on the other hand are just beginning to get going. Their material apart from one Bad Company sound-alike, was very metallic and very much in an 80s HM mould. Vocalist Mick Swan, brother of Tytan front-man Norman was the most promising member. Although his voice needs time to mature, he showed considerable talent considering his lack of gig experience. The theatre was less full on Saturday but not noticeably so, and the attendance was higher than Dave and Edward’s last gig a few weeks ago. Dave’s mixture of blues, folk and protest songs together with his own brand of humour kept the crowd thoroughly entertained throughout his two sets. His delivery and timing was impeccable, his guitar playing incisive and his singing superb as he went through a set of self-penned songs and his own versions of other artistes material. Highlights were an acoustic version of Hendrix’s ‘Purple Haze’ with the lyrics changed to suit Dave’s commentary on British public transport entitled ‘British Trains’, a satirical look at HM, two punk songs performed with Jed Moore and a stunning instrumental called ‘India’. Edward, seated appropriately in an armchair, read some of his poems featured on his recently-released cassette ‘The Armchair Guide to Insanity’. His word pictures were vividly painted, his delivery was suitably dry and his social comment biting. I particularly enjoyed ‘Beach Ball and Swimming Trunks’, a new poem vividly capturing a family day out at the seaside. The excellent sound system was provided on both night by Tamworth’s own PA hire company T.T. sound. TWO Tamworth bands take part in a major music competition next week. For The Unknown and Badger will be up against the best of Midlands’ talent in a rock and pop contest organised by the musicians’ union. 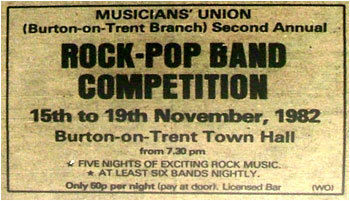 The competition is being held from Monday to Friday at Burton Town Hall. Six-band heats will be held on the first four nights with two from each heat going forward to Friday’s grand final. 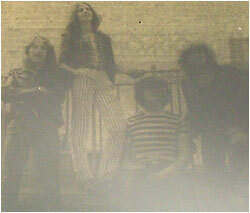 The Unknown’s heat also includes the Mark Fontana Band, Boulevard, Crystal Image, Livin’ Doll and La Resonance. They have a prime slot being the last band to go on stage in the Tuesday line-up. Badger have a slightly more difficult task. They will be the first band to appear in Thursday’s heat. The band will be competing with Minis Tirith, Lambent Lamella, New Regime, The Pick-Ups and The Second. Admission throughout the week will be 60p each night and there will be a licensed bar. TOW top local HM bands Flash Harry and Badger join forces for a special pre-Christmas gig at Polesworth Working Mens Club (Top Club) on Monday night – December 20th. For Badger it will be the first Tamworth gig since they recruited Tim Latham from Omen. FOLLOWING their considerable coup in attracting Harvest Moon to Polesworth Top Club organisers have lined up two more entertaining gigs. On Monday (February 7) Scarab are on the bill and Tamworth band Badger follow them on February 14. AFTER the success of the recent BHX/Java gig at Tamworth Arts Centre, another HM evening has been lined up. Experienced Tamworth outfit Badger are appearing at the popular town centre venue on Saturday May 28. The last time Badger appeared at the Arts Centre was last autumn when they supported Omen. Now of course former Omen guitarist Tim Latham is a member of Badger. Originally BHX were to have provided the support for the gig but personnel problems have forced them to pull out. The problems which have caused BHX to pull out are the loss of their bassist and drummer. They are on the look-out for new members to fill the vacant spaces and anyone with a serious, long-term interest should contact Mick…. TWO of Tamworth’s best heavy musicians are on the look out for a bass player and drummer to form a new band. Andy Malkin and Mick Swan formerly of Badger, are looking for talented individuals who like all types of heavy rock music.